Providing a comprehensive overview of the modelling, analysis and simulation of mobile radio channels, this book gives a detailed understanding of fundamental issues and examines state-of-the-art techniques in mobile radio channel modelling. It analyses several mobile fading channels, including terrestrial and satellite flat-fading channels, various types of wideband channels and advanced MIMO channels, providing a fundamental understanding of the issues currently being investigated in the field. Important classes of narrowband, wideband, and space-time wireless channels are explored in detail with descriptions of efficient simulation methods for mobile radio channels being central. Strong emphasis is placed on the detailed origin of the presented channel models and a high degree of mathematical unity is conveyed. 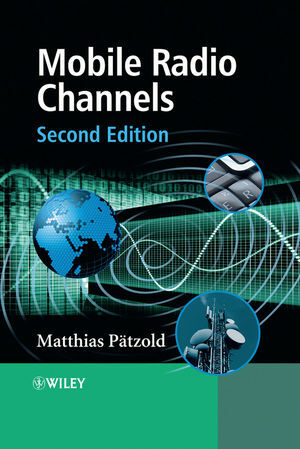 Using the described channel models, the reader can evaluate the performance of wireless communication systems under propagation conditions which are typical for multipath channels in various environments. Matthias Pätzold was born in Engelsbach, Germany, in 1958. He received the Dipl.-Ing. and Dr.-Ing. degrees in electrical engineering from Ruhr-University Bochum, Bochum, Germany, in 1985 and 1989, respectively, and the habil. degree in communications engineering from the Technical University of Hamburg-Harburg, Hamburg, Germany, in 1998. From 1990 to 1992, he was with ANT Nachrichtentechnik GmbH, Backnang, Germany, where he was engaged in digital satellite communications. From 1992 to 2001, he was with the Department of Digital Networks at the Technical University Hamburg-Harburg. Since 2001, he has been a full professor of mobile communications with the University of Agder, Grimstad, Norway. He is author of the books “Mobile Radio Channels - Modelling, Analysis, and Simulation” (in German) (Wiesbaden, Germany: Vieweg, 1999) and “Mobile Fading Channels” (John Wiley & Sons, 2002) and “Mobile Radio Channels, 2nd Edition” (John Wiley & Sons, 2011). His current research interests include mobile radio communications, especially multipath fading channel modelling, multiple-input multiple-output (MIMO) systems, channel parameter estimation, and coded-modulation techniques for fading channels.